Asia water companies are emerging from a tough 2011. Global Water Intelligence’s Asia Water Index fell 23.3% over the course of the year, compared to a 10% rise for US water utilities and a jump of 23.7% for Brazilian water companies. Companies with exposure to China’s water sector were among those dragging the index down, including Shanghai-listed companies like Sound Global (down 39.76% in 2011), Hong Kong-listed China Everbright International (slumping 31.13%) and prominent foreign companies including Hyflux (falling 47.8%). 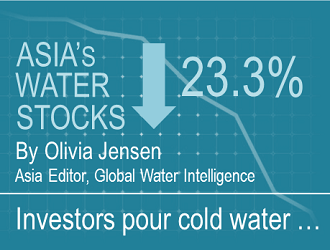 Most of the Hong Kong and mainland China-listed water stocks in GWI’s index ended the year down 20-30%. The only one to out-perform the market was the Shanghai listing of Tianjin Capital Environmental Protection (TCEP), but even this fell 14.4% over the twelve months to 31 December 2011, compared to a fall of 23% in the Shanghai composite. Analysts may be touting exposure to domestic growth in China as one of the investment themes of 2012 but the positive effects on the Asia Water Index are yet to be seen. This is not so much due to fears of phantom water infrastructure serving ghost cities but to the strong pull of market sentiment. These are not defensive, income-generating utility stocks, but volatile stocks held for capital gains that pay out tiny dividends. The Asia Water Index includes mainly investors and developers, but equipment suppliers were not immune from pessimism. All five of the water-related companies that listed on China’s mainland exchanges in 2012 saw significant falls in their valuations post-IPO of 30-40%. Jiangsu Welle Environment, which listed in March last year, came off worst, with a 43% drop in the year post-IPO. The problem for water companies is certainly not growth. Sound Global grew revenues by 64% in the last fiscal year, while China Water Affairs’ revenues were up 38%. TCEP’s revenue growth was more modest, at 6.15% year-on-year for the first half of 2011, but its long track record in the sector is working in its favour. Instead, it is risk that keeps down valuations. Chinese water companies are achieving rapid growth by amassing portfolios of operational water and wastewater projects – a very different picture from the typical American utility which sees modest organic growth in well established markets. Each project in China carries with it high levels of specific risk, in particular regulatory and political risk, and a new investor entering a project at the operational phase may not have built up the intricate fabric of relationships that companies use to manage these down. Many of the stocks that investors currently look to for exposure to the Chinese water sector behave more like real estate investments, swinging up and down with market sentiment, than reassuring, counter-cyclical utility stocks. In fact, the two sectors are converging in the strategies of companies like General Water of China which is developing land around its water resource projects to boost returns. However, analysts are bullish about the prospects for individual stocks. Chi-Man Wong, analyst at Piper Jaffray in Hong Kong, sees China Everbright International as a good bet. “The company will benefit from 12th Five Year Plan targets to invest more in environmental protection,” he said. Kai-Ting Wong at Deutsche Bank rates Beijing Enterprises Water Group a strong buy, and predicts that growth will continue at an annual compound growth rate of 22% through 2013. China water investors are hoping that the rumoured IPO of Sino-French Holdings, the long-standing and very successful water sector joint venture between Suez and New World, will take place on the Hong Kong exchange later this year. Sino-French will offer a water pure-play opportunity with a high quality project portfolio built up painstakingly over 20 years. Otherwise, 2012 is expected to be a quiet year for IPOs. Treatment plant and equipment provider Anhui Guozhen Environmental is the only water company out of more than 500 companies hoping to list on the mainland exchanges in 2012. The company’s intentions were revealed on 1st February when the China Securities Council published a list of companies that have submitted IPO plans, the first time that this list has been made public. Investors seeking exposure to the China water sector through overseas-listed stocks are seeing the investable universe shrink. Several companies went private in 2011: Asia Environment Holdings was bought out by Ciena Enterprises and ceased trading in October, while Sinomem, another small-cap stock on the Singapore exchange, was acquired by management and finally delisted in June. The performance of Chinese water stocks in 2012 was in stark contrast to performance in the Americas, where the indices out-performed the market. This is just how utility stocks ought to behave in tough macroeconomic times – as a safe haven for investors offering steady valuations and a good dividend yield. But the best performing shares of the year were in Brazil, where investors were attracted by the combination of emerging market demand growth potential and a stronger regulatory environment. There is no doubt about the growth potential in China’s water sector, but investors will need more reassurance on the other side of the risk-return equation if valuations are to rise. Click here to see a summary table of the stock performance of the GWI Index. We believe regardless of whether we care for the environment that water risks affect us all – as investors, businesses and individuals. Water risks are fundamental to future decision making and growth patterns in global economies. Water scarcity has emerged as a critical sustainability issue for China's economy and since water powers the economy, we aim to highlight these risks inherent in each sector. In addition, we write about current trends in the global water industry, analyze changes occurring both regionally and globally, as well as providing explanations on the new technologies that are revolutionizing this industry.